Written by andy bartotto on Tuesday, December 6th, 2016 at 2:00pm. 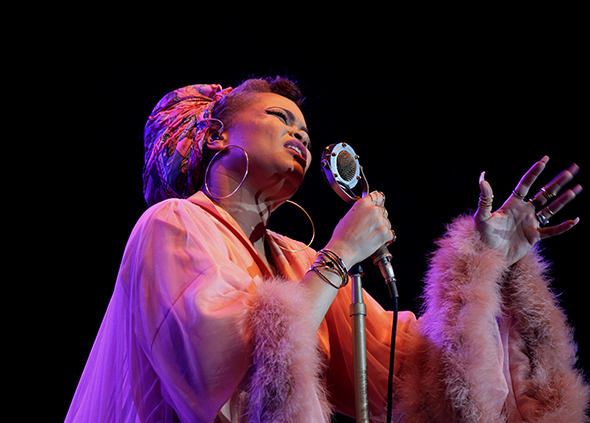 Andra Day has had a hell of a couple years: she released her debut album “Cheers to the Fall,” performed at The White House, Grammy’s, BET Awards, Sundance Film Festival, Essence Music Festival, the 2016 Democratic National Convention, and appeared on Jimmy Kimmel live and Good Morning America. Day’s singing ability is stunning, and hearing her live is truly amazing. Her voice draws likeness to some great singers: Ella Fitzgerald, Billie Holiday and Dinah Washington. As a special treat during her Humphreys performance, Andra Day was presented with an RIAA Gold (500,000 copies sold) award for “Rise Up,” which they officially certified/announced the next day. You’ve probably heard the song without knowing that she sang it. It’s been featured in a Beats by Dre commercial featuring Serena Williams, and more recently McDonald’s printed her image, and lyrics, on 50 million cups. We definitely look forward to hearing more from this graduate of the San Diego School of Creative and Performing Arts. Her voice is too amazing to go unnoticed, and she’ll make San Diegans proud with her continued success. Kicking off the night were sisters Chloe x Halle, who were discovered by Beyonce after their YouTube video covering “Pretty Hurts” was seen by the singer herself.